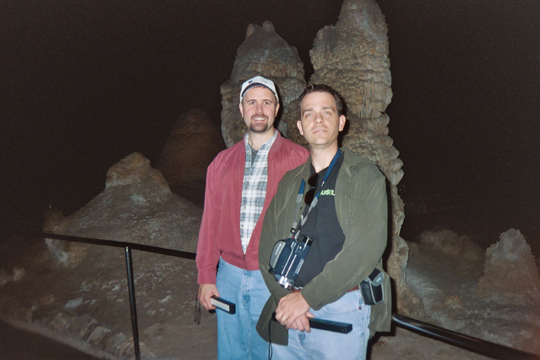 After the wedding, Chris and I took off with my Mom and Dad for one of the Great American Road Trips. We didn’t actually travel the Historic Route 66, although we spent a lot of time seeing signs for it – we were on I-40, which follows much of the same path. We drove nearly three thousand miles in the course of nine days, starting and ending in Dallas. Our first stop was at Carlsbad. It was amazing. I had been there before when I was 12, but Chris had never been. I LOVE caves. I was particularly delighted to get to see the bats fly out, which was magical. I hadn’t gotten to see that when I was a kid. Unfortunately, they don’t allow photography at all at the bat flights; cameras mess with their sonar. So, no bat pictures. We saw the bats fly out on our first night, then got up in the morning, walked down the natural entrance of the cave, and met my folks, who had taken the elevator down. 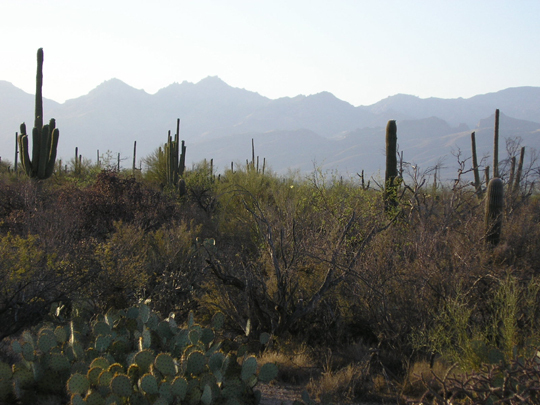 Next stop was the Saguaro National Park. I had seen pictures, but never really grasped how BIG these things are. 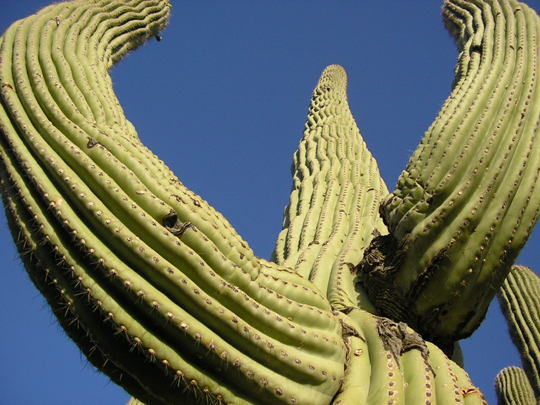 Average life span of a saguaro cactus is 150 years; they have to be at least 75 before they even start putting out the famous arms. Whatever little birdie lives here, it has one SECURE nest. 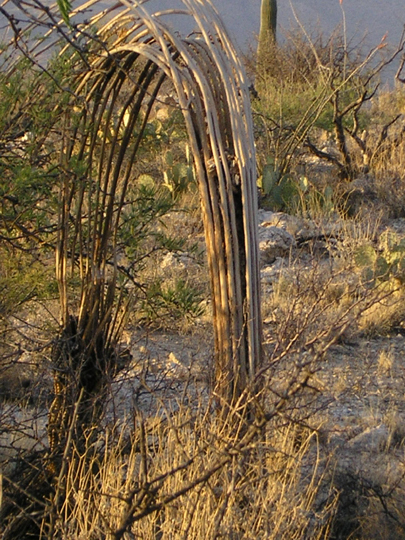 This is a cholla cactus, and the spines are wicked. 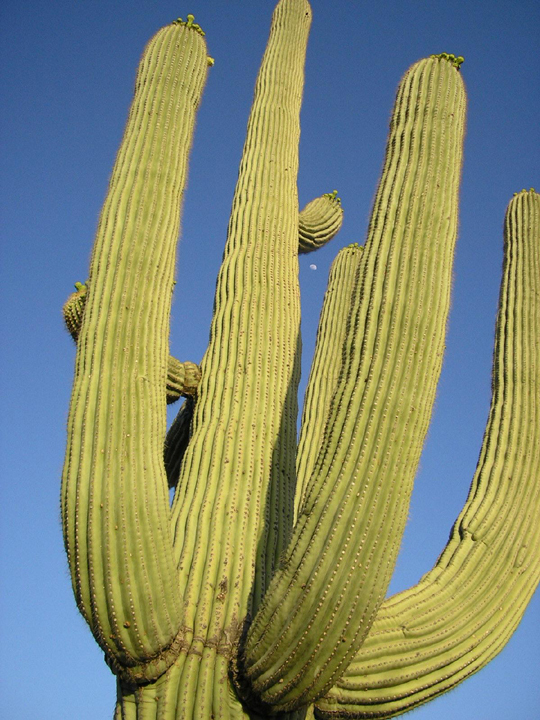 You can see the moon in this one, just up from the center, in the arms of the cactus. And here’s my Dad’s shot of me, taking the picture with the moon. 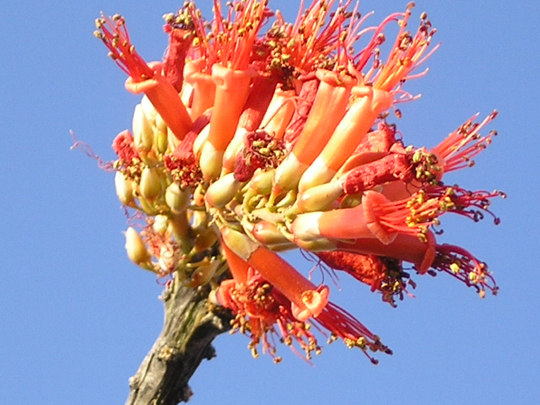 We saw a lot of this flower, called Ocotillo. 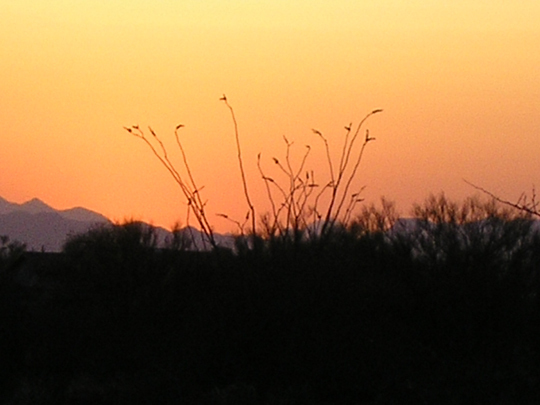 Some places, it had leaves – but out here in the desert, it was bare, with just flowers. It leafs out immediately after rain, and then drops its leaves to conserve water. 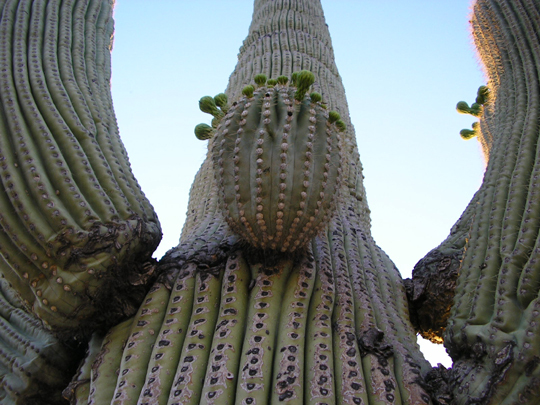 The saguaros were just starting to bloom. Most of them were only tight green buds. 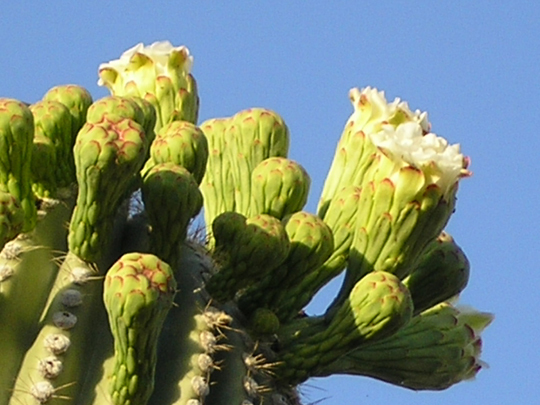 I managed to find the one cactus in the park with flowers on it. These will open out much more, to be flat like a daisy. I love how they get thicker and thinner by adding and dropping these ridges. It reminds me of increase and decrease rows in knitting. 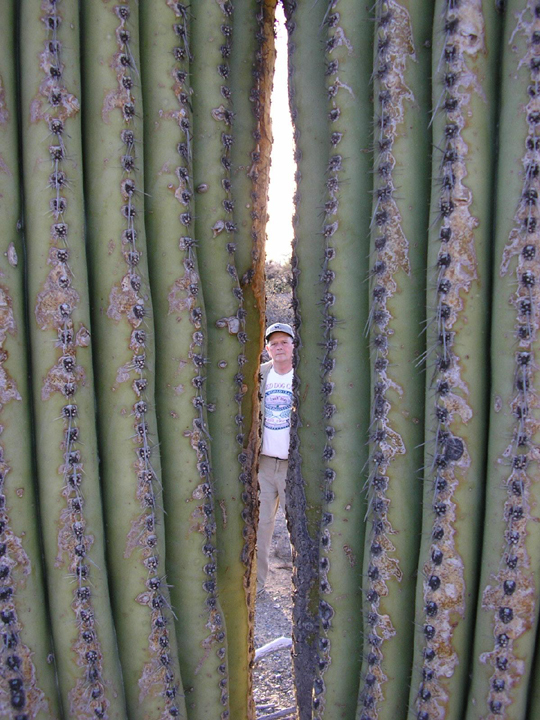 My Dad, between the branches of two big saguaros. 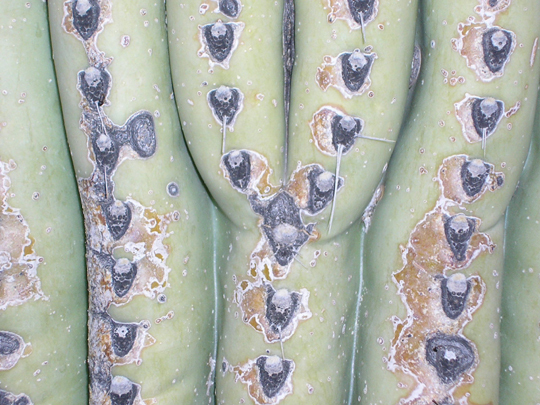 This is what’s inside a saguaro. 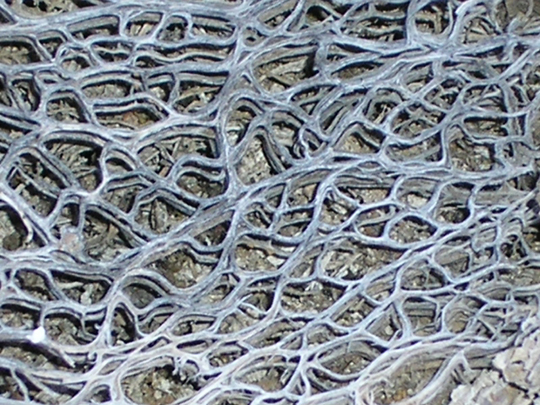 They have this big flexible skeleton that looks like willow basketry. This is what’s inside a prickly pear. It’s tough, like wood, yet springy. 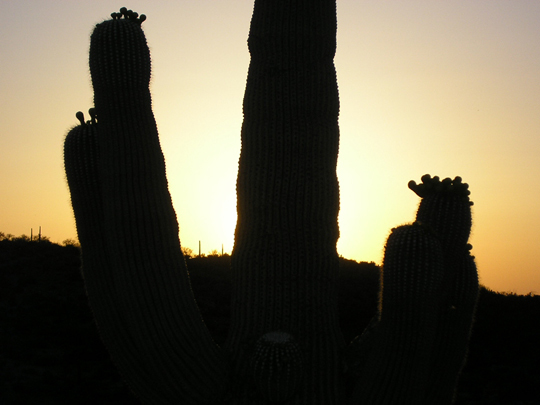 Sunset at Saguaro National Park – end of the second day. We spent the night in Tucson. Next, we traveled north into Arizona. 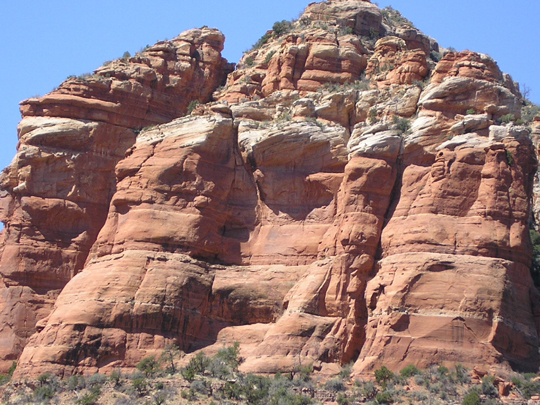 This set of photos is from Sedona, famous for its red rocks and eccentric spiritualism. 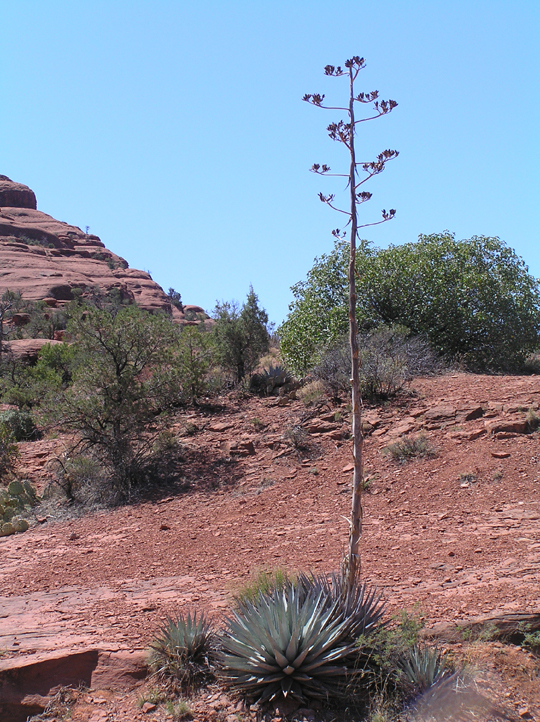 These agave plants were common. I like the pattern that the leaves create, and the prints they put on each other. 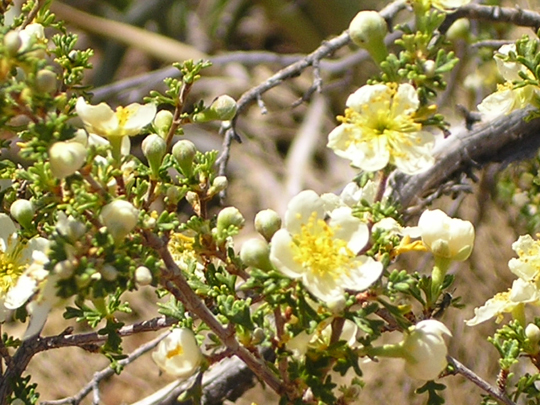 This is something called a Cliff Rose – it smells delicious, like honey. 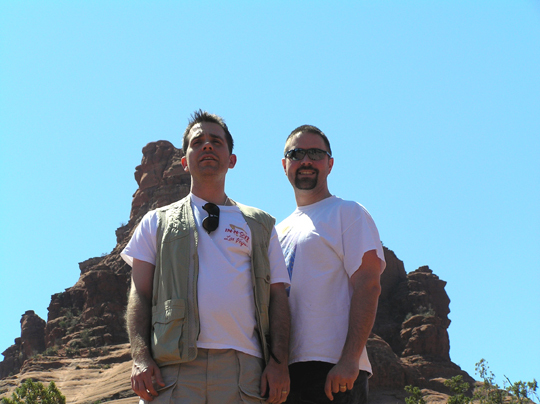 The big red rock behind us; I’m not sure if this is Bell Rock, or just a chunk of it. 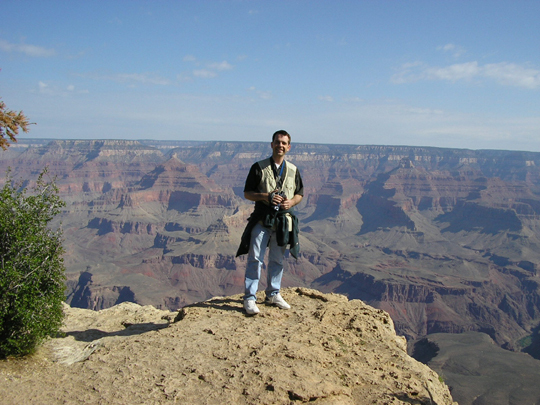 After Sedona, we stopped for lunch in Flagstaff, and then went on up to the Grand Canyon. 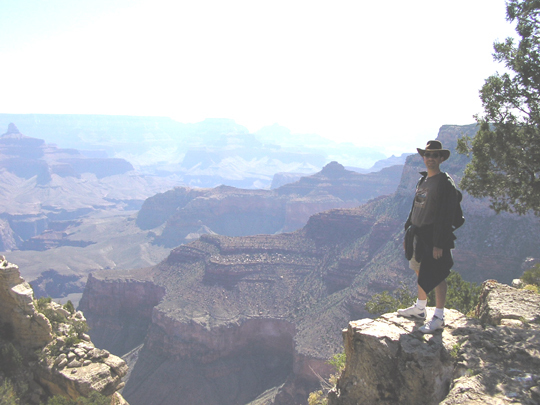 We were in a Canyon Lodge, which was wonderful – we were inside the park, and everything was close by. 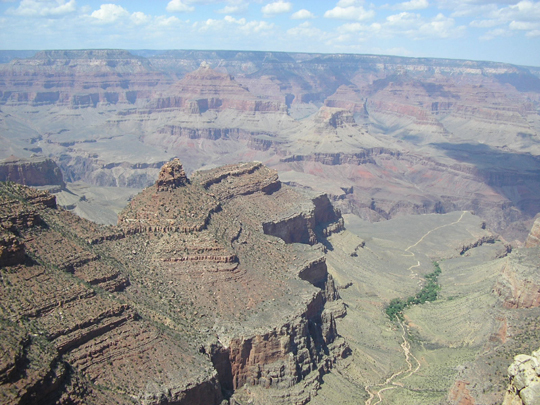 We could walk up to the Canyon rim, and catch the shuttles that took us everywhere inside the park. We got to hear coyotes howling at night, and watch the chipmunks play on the porch. 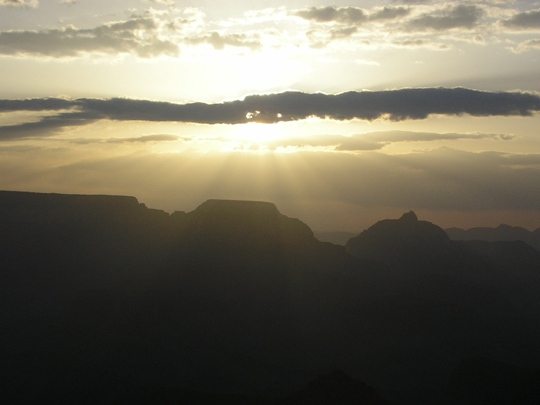 Sunrise over the Canyon. It was a little disappointing, because I was hoping for more color, but the clouds were just not quite right for that. 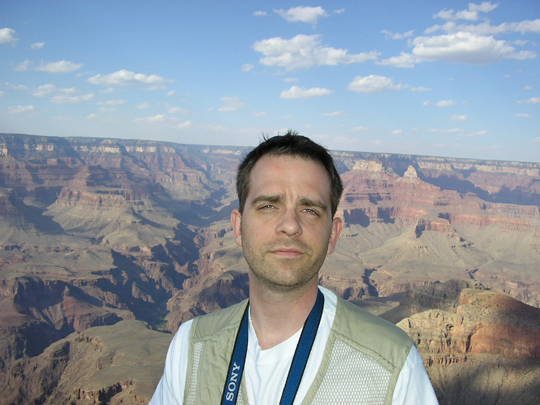 Chris, with the canyon behind him. And his eyes open! 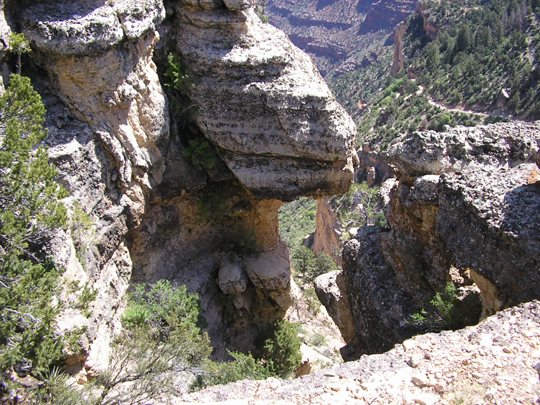 This is a view of part of the Bright Angel Trail. My family walked down this when I was 12, and we stayed overnight on a concrete pad at the bottom. It was… kind of traumatic, honestly. 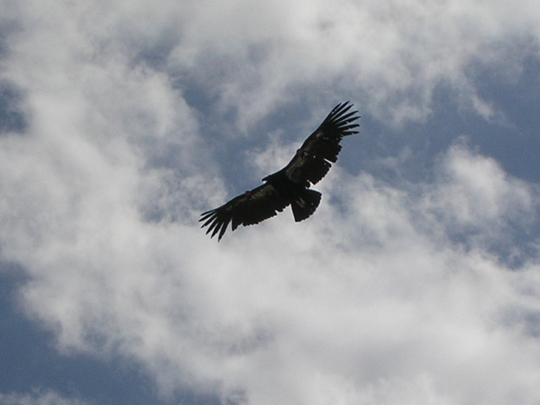 One of the coolest things that we got to see, were the CONDORS. 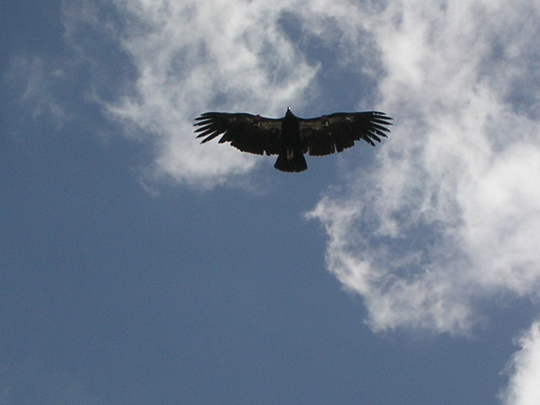 California condors have been reintroduced into the Canyon, starting just recently. It’s a big deal. They’ve always been a rare bird, but back in the 1980’s, there were something like twenty-two of them, total. We got to see five, including two babies. The adults are all marked with big numbers. The were swooping so close, that we could read them easily even without the telephoto lens. 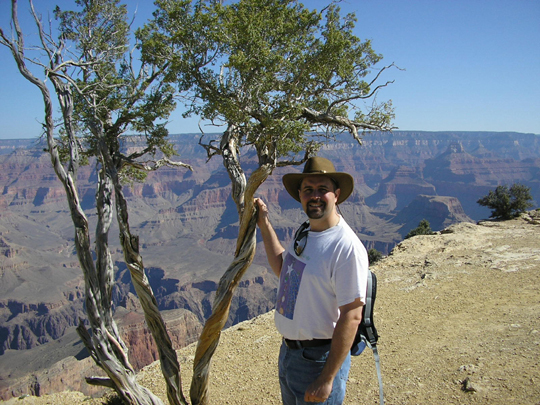 My favorite part of this trip, was Chris and I taking a ten-mile hike along the rim trail. It winds along close to the road for much of its length, but then it diverges for several miles and dips down into the Canyon. We got to see a lot of scenery that’s not on any of the big guided tours, and also spend some time out in nature together. It seems like climbing over rocks, jumping ravines, and skirting the edge of sheer cliffs is a very fitting symbolic honeymoon trip! We got to see lots of old-growth Ponderosa pine, but I didn’t get any good photos from it. The bark smells like butterscotch. Chris gave me grief for walking up and smelling the trees. Okay, so maybe I did it a little more than was warranted… but, BUTTERSCOTCH! Yum! The squirrels were exceptionally cheeky. More on them later. 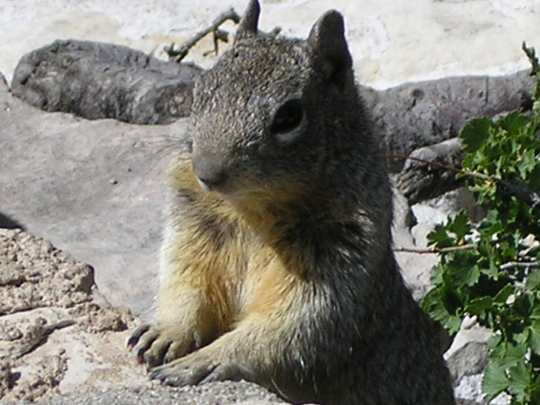 We actually did see one of the famous Grand Canyon squirrels with the black tufted ears, but didn’t get a photo. We saw mule deer, lizards, jackrabbits, and cottontails, too – but the photos of them didn’t turn out very sharp. I really enjoyed watching the ravens. They would fly in the thermals along the canyon walls, clearly playing… they would also pick up pieces of debris, and fly acrobatically with them – loops, upside down, death-defying drops, last-minute saves. They look like they have a lot of fun. 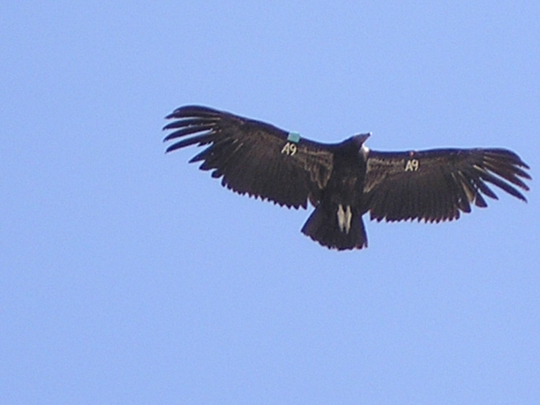 Another Condor – number A9. 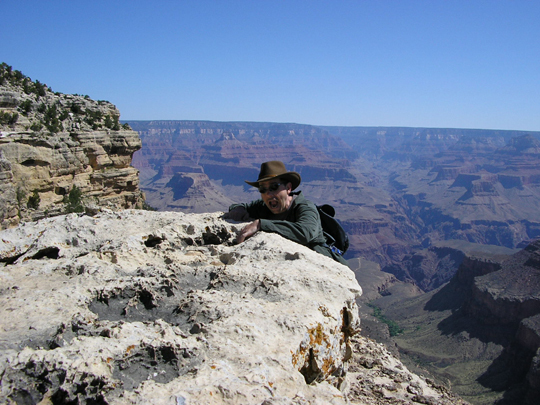 Chris demonstrates for your safety: don’t get too close to the edge. 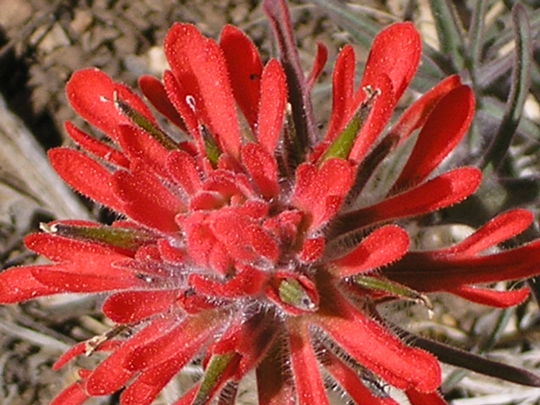 This is like a very spiky version of Indian Paintbrush. This is an example of some of the scenery we saw on our trail hike. 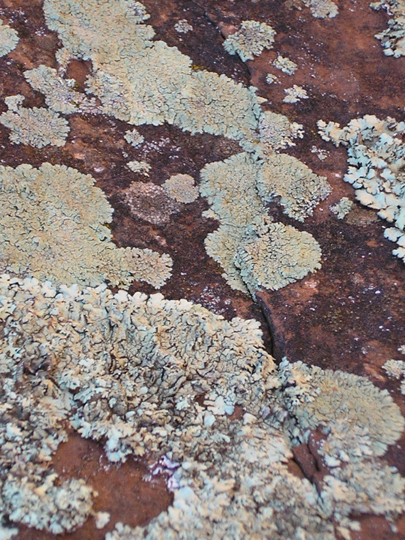 There were all kinds of little grottoes and niches, tucked away on folds of the trail. least, it wasn’t worth losing a finger over. They were cramming so fast, their little cheeks looked like they would explode. We went from the Grand Canyon on up to Santa Fe. We had a fabulous time there, but didn’t carry the camera around. We were in Santa Fe for three days. 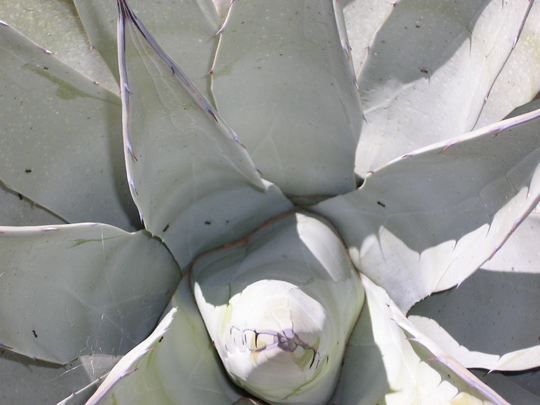 We went up to the Tusuque Flea Market, saw the Miraculous Staircase, had a lot of fun shopping in downtown Santa Fe. I learned that I shouldn’t eat pine nuts; they spent several hours on Saturday having a violent disagreement with my system. Sunday, we went for one more quick tour through the downtown, then to a really neat Artists Market and Farmers Market, and then headed out. We stayed overnight in Midland, and then back to Dallas. Special thanks to Mom and Dad for the trip, and to Mom for letting me steal her camera a lot! Great photos – love ’em! Sounds like the kind of road trip I’ve been craving.. down to seeing a cave. I love doing that! Congrats, btw! 🙂 and best wishes! Thank you so much for sharing your pictures. your parents are so awesome 🙂 Congratulations on your marriage, what a wonderful step towards a forever companion! The trip looks like it was a blast and half, I’m soooo tickled for you!!! Wonderful pictures. It sounds like it was a fabulous trip. I glad y’all had a grand time. Hee. There are some real charmers in the cut pile. I’ll have to work up the one with me in the morning, trying to drink my soda! Awesome awesome awesome. Thank you for sharing. It makes me miss the mountain hiking that I used to do as a kid in Wyoming. 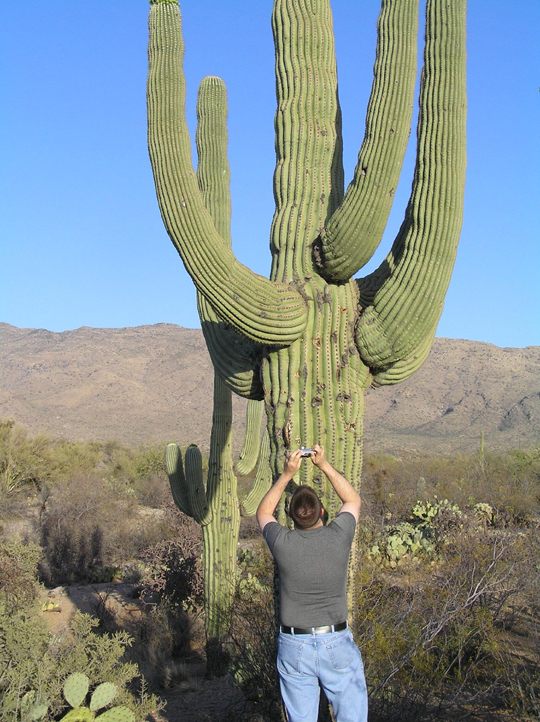 the Saguaro National Park is a sight to behold…….my paternal grandmother lives in a little town called Ajo……right in the middle of it……..maybe you saw signs showing the way………. 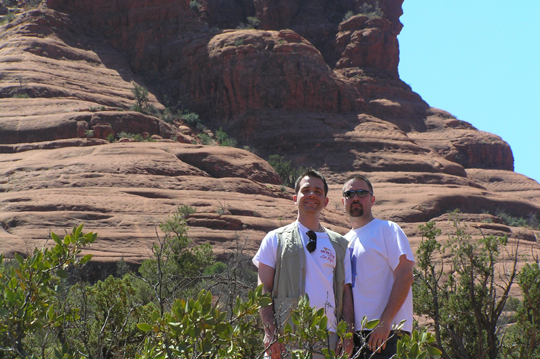 anyhow, looks like you had a great trip……thanks for sharing! It’s like stepping back into the 50’s. 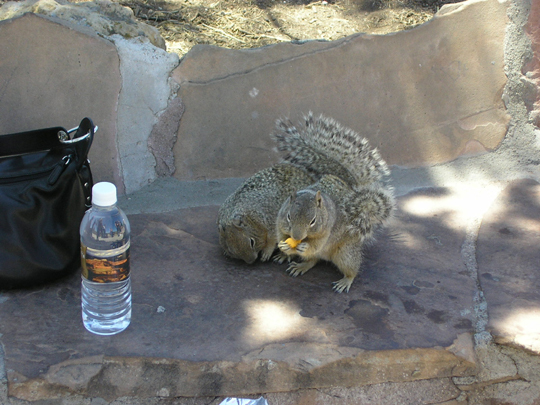 ;-> Right down to the feeding the squirrels. Too bad you didn’t actually get to Route 66.
great pictures! thank you for sharing them! 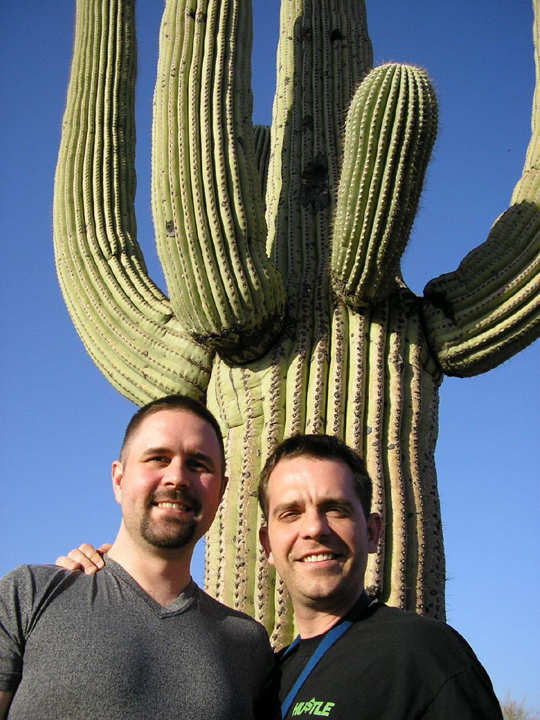 I’m glad you included the one of you taking the photo of the cactus. They looked big, but that truly put it into perspective. Good gracious! My cat actually stared at the squirrel pictures for a long moment… it looked ready to jump out of the monitor! Hilarious about the goldfish crackers, I wish I could have seen that. What a fantastic trip, I think it is beautiful you went with your parents, they must be awesome! Hurray, you went to my home state! 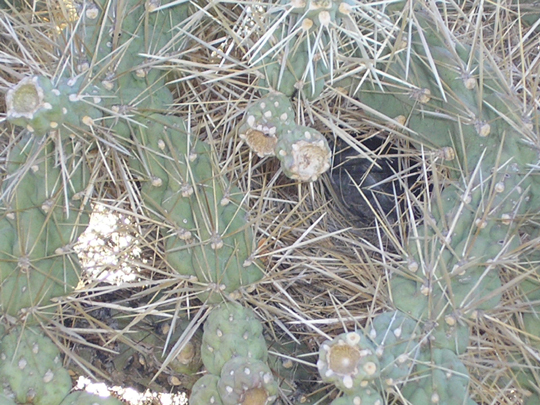 :::preens:::: The bird that nests in the cacti is, appropriately enough, the cactus wren. 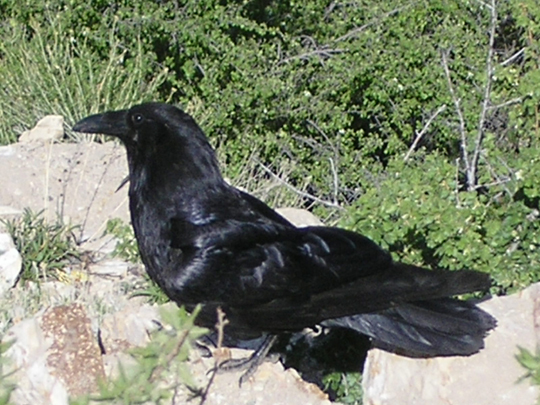 It’s the state bird of Arizona. 😉 Lovely lovely pics, thanks for sharing them, even if they did make me homesick for the desert. It looks like you had a great time. Hee – cool! Thanks for ID’ing the bird. We never did actually see one, just lots of the nests. Hee – that’d be very cool! We saw several with clearly readable numbers; I know that the babies didn’t have numbers (yet) but all the big ones we saw did. We actually were adjacent to several little bits of it; there were lots of “Historic Route 66” signs. Wow … those photos are stunning! Makes me wish I could travel! Glad you guys had a good time! Lovely photos- thanks for sharing them with us! Enjoy the rest of your trip! I remember going down 66 when I was a kid- before 40 was complete. That was fun. oh wow!!! what fun, so many grand photos! You are a skilled photographer! Beautiful pics….so happy you had a wonderful time….congratulations on your nuptuals! I don’t believe they tag the chicks in the wild, just the ones hatched in captivity. I was lucky enough to work with the condors in San Diego. It was amazing. glad to see you guys are having a great time! Great pics! Thanks for sharing! Cute man ya got there. Thanks for sharing these fantastic photos! What a memorable trip! Oh my god those are the best pictures ever! I love that location of the country. I so want to do what you and C have been able to do. 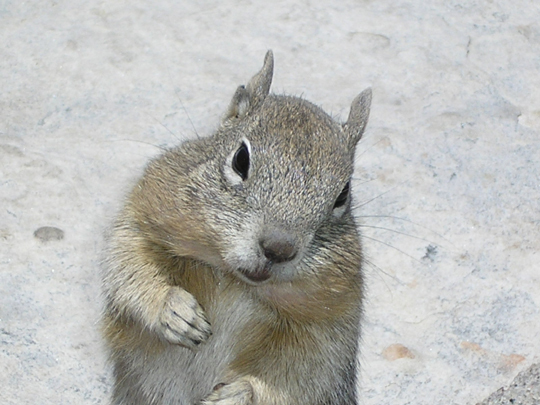 And the squirells are just cute as all get out.